The three-headed monster. 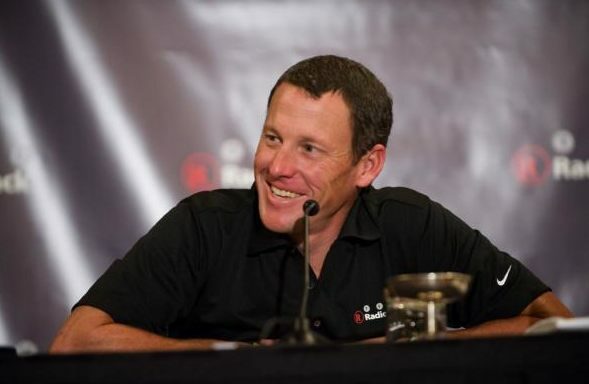 Armstrong hints at 2010 Tour de France tactics. Lance is number one but two and three might be. This just in from Radio Lance: he will not be the sole leader of the Radio Shack team in the upcoming Tour de France. The statement frames the tactics and sets up the possibility for plenty of surprises for July’s battle in France. The Radio Shack team versus Alberto Contador and his leftovers. Manager Johan Bruyneel and Armstrong will have Leipheimer and Kloden attacking at every opportune moment, keeping the Spaniard guessing and wearing down his weaker team. The scenario becomes even more dramatic if the race radio ban goes into effect, making it harder to make rapid decisions on controlling the multi-headed monster from Radio Shack. The possibility of tactical mistakes will escalate and that clearly works to the advantage of Armstrong and Bruyneel. Contrast the Grand tour experience of Bruyneel (ten victories) with Astana manager Yvon Sanquer (one Vuelta back in 2001) and you have a mismatch. In his first official press conference for the new Radio Shack squad, Armstrong sounded more confident than ever about his comeback and his team. Meanwhile his Spanish rival is already apologizing for his back-up band and hedging his bets. “I know that it will be a difficult year; it’s possible I won’t be able to win the Tour even if I am in good shape. People will be focusing a lot on me, but my rivals know that the team I will have is not the same as before.” Uh, that’s because they’re all wearing Radio Shack jerseys. The first Astana camp begins this week. With so many new riders coming in, the Spaniard will need name-tags — “Hi, I’m Alberto” scribbled in red ink. Twisted Spoke hopes Yvon Sanquer has some team building exercises in mind, like playing Twister, Kazak Karaoke and flamenco dance lessons. We’re sure Alberto Contador would say things feel different, too. « Armstrong’s new Radio Shack jersey. The subliminal messages behind the R.
Asking Kloden or Leipheimer to attack is like asking van Hummel to win the KOM. Henkio, I have two words for you my esteemed friend and regular reader: Oscar Pereiero. It doesn’t take much. If Leipheimer or Kloden get 3-4 minutes on a breakaway that Contador decides not to chase down and Radio Shack wins. It could happen. Alberto has a weaker team and Radio Shack and Saxo are gonna hammer him for day one. I honestly don’t believe Levi is good enough for a top-10 next year. Kloden has the attack speed of an old lady. Anytime these two (or the equally slow Zubeldia) will go you will see at least 5 riders who will want to go with them. Guys like Basso, Kreuziger, Nibali, Gesink, Menchov, Sastre, F Schleck, Evans etc. All those guys have better chance at winning the TDF. Those guys know they won’t beat Contador if they wait for a mountaintop finish. I totally agree Contador could be beat that way, I just think Shack has no chance at all in doing that with their squad.